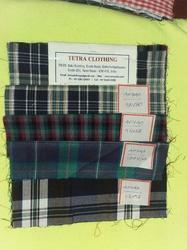 Width: 35-36", 58-60", 72", 44-45"
Powerloom Tartan Madras checks available in fats, Yards. Known as a renowned organization, we are engaged in offering a wide range of Yarn Dyed Poplin Fabric to our valued customers. Available in intricate designs, this Yarn Dyed Poplin Fabric is perfect for designing numerous outfits. In addition to this, we are offering this product at market-leading rates. Preference will be given to Local buyers. Minimum Order Quantity :-1000 meters. Providing all types of yarn dyed fabrics. 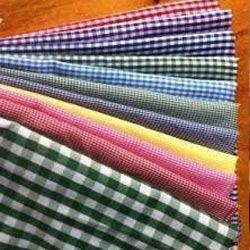 PRESENTLY WE ARE RUNNING OUR OWN YARN DYED WOVEN CHECKS TWILL FABRICS ON LOOK ABOUT 50 TO 60 NEWLY PATTERNS IN WIDER WIDTH. PRODUCTION IS GOING TO COMPLETE FROM LOOM THIS MONTH (SEP) END.This fabrics is suitable for winter clothing . We can supply fabrics in unwash condition / soft water wash with zero zero / with one side medium brushing . The yarn count is 2/17 x 10" (Rxp= 40 x 40) . These yarn dyed fabrics can be made as per buyers specification, shade in stripe and check in different width. Also we can supply organic cotton fabrics.